A great day of baking Sylvia! Hello and Thank You, Andy! I'm gradually getting back in the swing of baking now the fall is upon us. I guess I will have to refer to myself as a 'fair weather baker', especially when it comes to firing up the WFO 'lol'. Much success to you Andy and your hard very hard work. Say hi to your dad for me..I sure miss my dad and his handwork. The last thing he made for me was a breadboard. I have been MIA for a while on the forum...life. I made your semolina formula yesterday after the double build. They turned out so beautifully. I will make it again as soon as these loaves are gone. It has been awhile. Always great to hear from you. I'm so happy you are enjoying the semolina loaves and thank you for trying them. The loaves pictured above also used the double build levain. You really made a nice score on the caputo 00 :) I bet the resturant has some great tasting pizza's! I did make some butternut squash ravioli http://www.thefreshloaf.com/node/29999/butternut-squash-ravioli-and-dill-pickles. I have to say I absolutely love the texture of the ravioli pasta's made with this flour. I did make it without the addition of durum flour. I wouldn't hesitate to bake most anything with this flour...other than I tend to save it for pizza's or anything pizza related and pasta because it is expensive for me to obtain for now. The bags I have are labeled Chefs Flour and picture breads, pizzas, pannettone on the front photo. I was very tempted to use it for my pie crust...maybe next time. I hesitated because I think this flour works so wonderfully for browning in the high heat of the WFO. I wasn't sure how it might work for a plain crusted pie dough. ps..I just made ravioli with the caputo flour a couple of days ago and froze them. Beautiful baking, Sylvia! The pie in particular is making it hard to concentrate right now. The lemons are a brilliant idea, I'll have to pass that one along to my wife, the pie baker in our family. Thanks! for stopping by and leaving a such a nice comment. I'am into lemon's. Especially having a nice lemon tree that puts lemons out year round..I'm always looking for someway to enjoy it's lemons. I think your blueberry pie looks wonderful, and your sourdough loaves as well, with such an inviting crumb and crust colour to them. Your just teasing me ;^) though with the mention of the Cuban roasted pork shoulder and not showing a photo of it. A very tasty looking feast Sylvia! One day I hope to make my favorite pie ;) Thank you for the very nice comments and the Cuban pork roast was pretty tasty...the down side of it was a very small roast, just enough for the two of us. Guess what, it was only a crock pot roast...hey, I had my oven and hands full making pie and bread : ). It did keep things a little cooler in house too.. 'lol'. My dream would be to have a Cuban guy cook a whole piglet in the WFO...In the recipe I used, I don't think they really add all those spices. Nothing that a proper WFO roast wouldn't improve upon. But I have another one in freezer. Thanks for the photo Sylvia, it's as mouthwatering as I'd imagined! 1. Pies, tarts, flans, galettes 2. Pizza 3. Cake - especially cheesecake 4. Ice Cream - especially chocolate mocha 5. Cookies - especially chocolate ones 6. Chocolate anything (even though dogs should never have chocolate since it is poisonous to them -dogs just don't know it) 7. Ribs 8. Chicken - Any kind 9. Fresh Fruit 10. Fresh Veggies. Sometimes, we never know when or where, she just has to blurt out as a scream..... KUCHEN!!!!! We don't know why this happens either but, this can be embarrassing - especially at funerals and silent prayer vigils among others like men's bathrooms. If you really care about what other baking apprentices think of you, and she does, these outlandish outbursts and blurtations (a new word) should be pure nightmares. But, being a founding member of the 'I Couldn't Care Less Society' (quite true but not at all what you think it is) it dosen't bother my apprentice in the least. She just hopes someone will forgive and forget and give her a piece of pie just like yours - even if it only comes her way out of pity. Sad really. The bread, the pies, the lemons and pork shoulder just look and sound delicious (even though we didn't see the pork shoulder). The crust and crumb of your bread is just great and the open crumb is really outstanding since you have 20% WW in the mix. I can't get a crumb like that with 15% Whole Grains - even when adding Yeast Water to SD Levain :-( Just fantastic! I do share your apprentices enthusiasm for all things good to eat...especially pie! The problem is I like to eat what I bake or feed it all to Mike...neither is a good. I do sympathize with your chocolate loving apprentice. I have one too :) What's a baker to do! I cheated on the whole wheat addition and upper my hydration to 68% it did help the crumb. Thank you for the compliment! My simpler roasted Pork shoulder up above..pretty tasty, but I most enjoyed the roasted brussels. That pie looks amazing ... and the lemons are such a great idea. I won't say I'm not taking it easy today..just housework and simple meals. Thank you very much for stopping by and your comments are very much appreciated :) I thought my lemon wheels which switch up this BP. Sure do love the way you use citrus in your cooking and baking - everything must have tasted just wonderful. 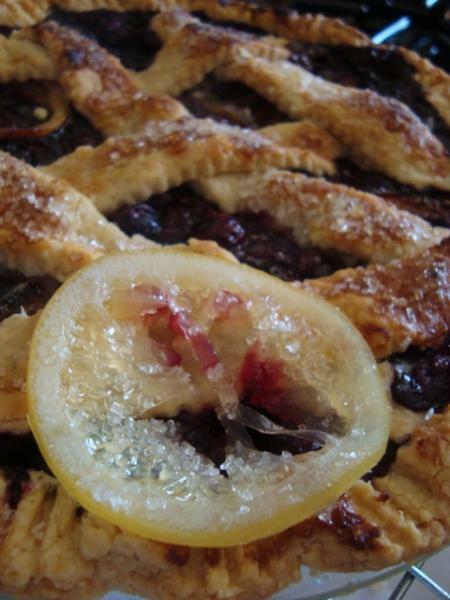 The lemon wheels, peeking out from your perfect lattice pie crust, hint at the flavor inside - lovely! 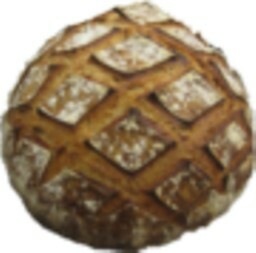 And, your bread looks fantastic - really nice baking and cooking, all the way around. Glad to see your post! I absolutely love your idea to add the candied lemon wheels to a blueberry pie, and the way you've tucked them under the lattice is very appealing. Gorgeous boules, too, really tip-top. I'm also working on pies today ahead of a big family gathering this weekend- making concord grape and Italian plum, and if have time I may also do an apple crisp. Hello and Thank You, FlourChild! Pastries, I have such a weakness for pastries. It's fun to add and try new things no matter how small and when they please me, it's responses like yours that puts a really big smile on my face. Your pies and apple crisp sound very delicious and I'm sure a real crowd pleaser. Have a wonderful time baking them and lot's of big smiles to also enjoy as they are consumed!